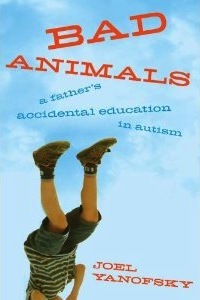 "Bad Animals … offer(s) a sceptical, darkly humorous take on autism lacking in most of the literature out there…. I’d need a neck brace had I nodded every time Yanofsky described a situation I could relate to." - Emily Donaldson, The Globe and Mail. Read the whole review. "I love books where the author has the ability to make me laugh out loud one moment and fill up with tears the next. (Bad Animals) does all that, and more. It is reflective, touching, humorous and heartbreaking. It is a memoir about life, written by an extremely talented author." - Kelly Wilton, Montreal Families. Read the whole review. "If you want a highly readable, informative and, dare say, entertaining telling of what a family, and a marriage especially, goes through when hit with autism spectrum disorders, look no further." - James Manishen, The Winnipeg Free Press . Read the whole review. "With self-deprecating humor and searing honesty... Yanofsky reveals the painful frustration and the powerful bond of love between him, his wife and their 11-year-old autistic son, Jonah. An eloquent memoir." - Kirkus Reviews Read the whole review. "Joel Yanofsky has written a staggeringly painful and candid account of trying to cope with his son's autism.... an essential (story) for both parents of autistic kids and those would understand more about (autism)." "Joel Yanofsky has taken on just about the hardest of literary tasks, writing about life with an autistic child without succumbing either to sentimentality or bitterness -- producing a book that seems both truthful, in its refusal to put too bright a face on a hard reality, and tender, in its insistence on the mysteries of love." "Bad Animals is a father’s memoir about life with his autistic child... Dusted with despair and disappointment but buoyed by gratitude and hints of hope, Yanofsky shares his evolving emotions and relationship with Jonah as frustration and self-pity slowly give way to acceptance and joy. Success is measured in very small steps. Without being preachy, Yanofsky imparts some valuable advice. He stresses that autism is not the parents’ fault and that love and patience combine to help mothers and fathers step up to the challenge of their child’s illness. Caring for an autistic child can be associated with a sharp or steep learning curve. Yanofsky provides a welcome perspective on autism and fatherhood." "Written with humor and lots of self-criticism, Yanofsky’s candid look at his family’s daily struggle and his expectations for his child’s future prompts his realization that he could be a better father and husband. VERDICT An entertaining memoir that also gives factual information about autism. It should appeal to parents of children with high-functioning autism as well as those new to the disorder."